Every mailing list service offers simple personalization of e-mails. However, it often happens that you don’t have personal information for every one of your subscribers. With SendPulse, you can easily create a template that is tailored for each recipient. We call this smart personalization, and it works with macros. If you have an address book containing additional details for your recipients, you can send different e-mails within a single mailing. Everything depends on the details that you specify in variables. 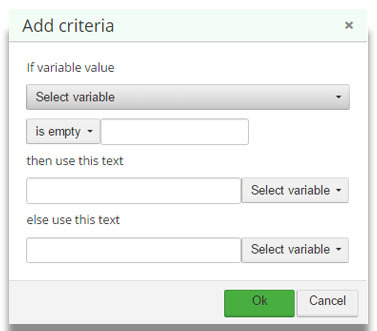 Conditions are stated in the following way: if the value of a variable is void/equal/not-equal, etc., then Text 1 is sent out, and in all other cases Text 2 is sent out instead.